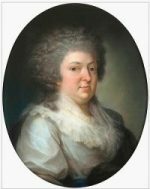 In New York in 1780, BARONESS FREDERIKA VON RIEDESEL gave birth to a girl. She and her husband had hoped for a boy “but the little one was so pretty we were reconciled over its not having been a boy.” They named her America. In the fall of that year General von Riedesel was finally exchanged and placed on active duty on Long Island. His wife and family settled there and the Baroness described the prospect from their house. We had magnificent view from our house. Every evening I saw from my window New York all lighted up and the reflection in the river, since the city is built right on its bank, We heard also the beating of drums, and if all were quite still, even the challenges of the sentries. We had our own boat, in which we could reach New York in a quarter hour or so. They arrived in the fall, traveled to Upper Canada and took up residence in a house built for them in Sorel. Read this post about the holiday entertainment the Baroness provided for English and Hessian friends. She is credited with having introduced the traditional German Christmas tree, a decorated fir, to Canada. sisters and friends—all pressing round him to see again their loved ones. 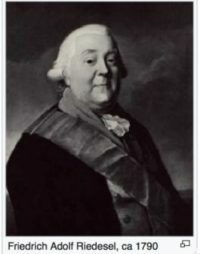 Baron von Riedesel continued service in the military and died in 1800. In the same year the Baroness published her journals. She died in 1808 at the age of 62. The Riedesels had nine children, of whom six survived beyond the age of one, including, finally, a boy. As for the so-called CONVENTION ARMY, when the British became active in Virginia the prisoners were marched north, eventually to Lancaster, Pennsylvania. At that time (the fall of 1781) British prisoners numbered approximately 1,200 and German officers and men 1,450, less than half of those who had surrendered at Saratoga. The British prisoners were moved to purpose-built Camp Security in York County and the Hessians to Reading. They were held there until the end of the war when those remaining were marched to the nearest ports and sent home. Their number was much depleted by desertions, especially among the Hessians, the rigors of the marches, lack of adequate food and shelter, and widespread illness. Additional information about the Riedesels can be found HERE—the passage quoted is on page 406—and in this source: Baroness von Riedesel and the American Revolution, Journal and Correspondence of a Tour of Duty, 1776-1783, A Revised Translation with Introduction and Notes, by Marvin L. Brown, Jr. (Chapel Hill: The University of North Carolina Press, 1965). For documentation on the Convention Army and additional information read this excellent ARTICLE by Thomas Fleming. The portrait of Baroness Riedesel, c. 1795, by Johann Heinrich Schröder (1757–1812), pastel on paper, is at the National Museum in Warsaw. 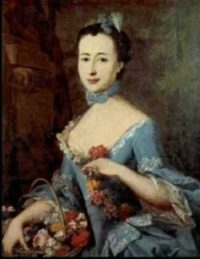 While BARONESS VON RIEDESEL and her husband and children were in Virginia with the Convention Army in 1779 there was talk of an exchange. If it could be arranged a prisoner, one usually of rank, would be exchanged for an American held by the British. On the basis of this news the von Riedesels packed up and began their journey to New York where the exchange was to take place. The Baroness journeyed with the children to York, Pennsylvania, where she was to meet her husband. She was much impressed with the “magnificent countryside” inhabited by “Moravian Brethren.” Continuing to Elizabeth Town, New Jersey, they anticipated crossing over to New York the next day, hoping to “be set free that same evening.” However their hopes were dashed by a messenger from General Washington that Congress had not given approval to the exchange and that they must return to Bethlehem to await developments. The Baroness, pregnant, was disappointed and exhausted. At the end of November they were given permission to go to New York City on parole. The Baroness and the children were housed in the mansion of Governor Tryon and subsequently repaired to country home of British General Henry Clinton where the children were vaccinated against smallpox. The following is from a previous post. The estate was lovely, as was also the house, but the house had been built more for a summer residence, so that, as we were there in December, I suffered a great deal from the cold. However, the inoculation was a success. When it was over, and we henceforth no longer had to fear contagion,we prepared for our return to the city and sent our cook and the rest of the servants on ahead to get everything ready for our arrival the next day. However, we had such a terrible storm that night, that we thought the house would be blown down. In fact, an entire balustrade actually was torn off and fell to the ground with a dreadful crash, and when we woke up the next morning we saw that four to five feet of snow had fallen in the night, and in some places there were snowdrifts eight feet deep, so that it would be impossible for us to leave without sleighs. I tried therefore to get together whatever food I could for our dinner. An old chicken which had been forgotten was used for soup, and this with a few potatoes given us by the gardener and some corned meat, which was the last of our supplies, formed our whole dinner for fourteen people. In the afternoon, as I was sorrowfully looking out of the window, thinking of how we could get along, I saw our cook approaching on horseback. Full of joy, I turned around to tell the others about this. When I looked out again the cook was nowhere to be seen. Horrified at his disappearance, the gentlemen ran out and found him with his horse buried so deep in the snow that he could never had gotten out alone and probably would have died. Our people in the city had become uneasy when we did not come, and knowing that we had no supplies, the cook brought us some food for supper. It was impossible for a carriage to drive to the city. The next morning Captain Willoe brought us two large sleighs. We got in and I was rather worried about the children, because their inoculation had not yet entirely healed on account of the awful cold. But the trip did not hurt them a bit. While their inoculations were healing, Caroline did not have her whooping cough, but it set in again immediately afterwards and hung on for a whole year. *The house was the Beekman mansion “Mount Pleasant,” built in 1763 for the New York City merchant James Beekman. On a rise between 50th and 51st Streets between First and Second Avenues, it is commemorated nearby as Beekman Place. The mansion served as the British military headquarters during the Revolutionary War. American spy Nathan Hale was held, tried, convicted, and condemned there in 1776. In the next post: concluding the von Riedesels’ stay in America. The above passage was taken from pages 97-98 in Baroness von Riedesel and the American Revolution, Journal and Correspondence of a Tour of Duty, 1776-1783, A Revised Translation with Introduction and Notes, by Marvin L. Brown, Jr. (Chapel Hill: The University of North Carolina Press, 1965). The illustration is a wood engraving, 1876, from the Granger Collection.